Spotted Cow goes with everything especially turkey. My ‘Spotted Cow’ brined turkey has quickly become a Friendsgiving staple and always receives rave reviews. Now if you’re not a turkey expert you are probably wondering what is brining and why do we do it. 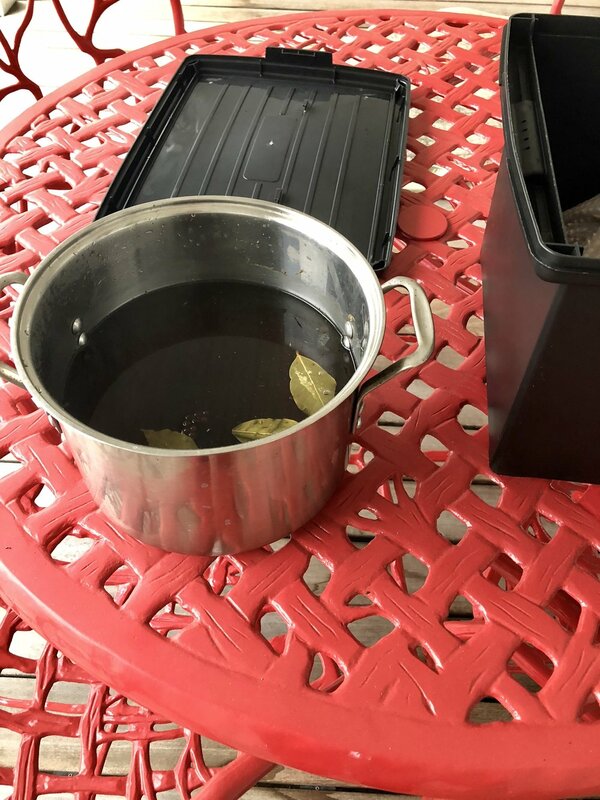 The spark notes response is that brining is soaking meat (in this case turkey) in a salt/water mixture to help it absorb extra moisture and flavors. Brining makes it WAY easier to avoid making a dry turkey. Add water, salt, brown sugar, peppercorns, sage, thyme, garlic, and bay leaves to a pot and bring to a boil (stirring occasionally). Once the mixture is boiling, turn it off and let it cool to room temperature. Add four spotted cows to the cooled mixture. Then stir in two cups of ice cubes. Put your turkey in the brine bag or container you are using and pour in all of the liquid. Make sure you have taken the giblets out of the turkey. Refrigerate for up to 24 hours. Flip over the turkey 2-3 times within the 24 hours. Now that your turkey is brined take it out of the brining mixture and pat dry with paper towels. First prepare the rub by mixing the Paprika, Salt, and Pepper. Then set aside. Next you will want to slice the butter into small pieces. Start separating the turkey skin from the meat and put butter between the skin and meat. Here is a useful video on how to do this. The butter will make the skin crispy and help prevent the turkey from drying out. After you have used up the stick of butter now, it is time to stuff the cavity. I like to slice the pears and lemon in quarters. First, rub the cavity with salt and pepper. Then toss in the butter and garlic cloves. Finally stuff the cavity with the rosemary, sage, thyme, lemons, and pears. I try to distribute the ingredients evenly. Finally, rub the turkey skin with the Paprika, Salt, and Pepper mixture. 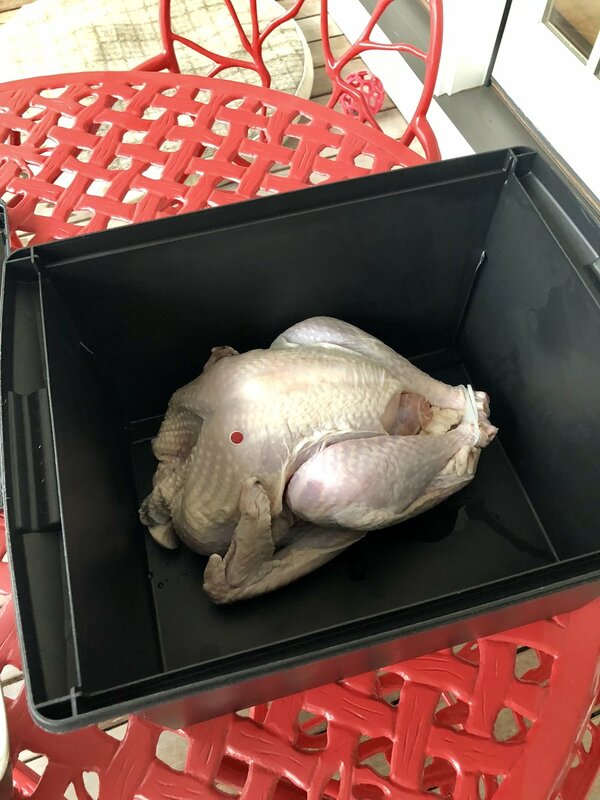 Then transfer your turkey to its baking pan. I first wet the cheesecloth with a little water then cover the turkey with the cheesecloth. The purpose of using the cheesecloth is to keep the turkey from drying out. Put the turkey in the oven. Because I use cheesecloth I do not baste my turkey often. Basting is taking the cooking juices and applying them over the turkey with a baster. The reasoning behind basting is to prevent the turkey from drying out. For your actual turkey cooking time, it depends on the size of the turkey. The rule of thumb is 20 minutes per pound. Thirty minutes before your turkey is done take off the cheesecloth and baste with the juices that have gathered at the bottom of the pan. To determine if the turkey is fully cooked use a meat thermometer to register the temperature at the thickest part (I usually check near a wing or thigh). It will register 160 degrees Fahrenheit when ready. Once you take the turkey out of the oven cover with aluminum foil and let it ‘rest’ for thirty minutes before carving. Winter is here. The arrival of this cold white wonderland brings with it some of my favorite things: big sweaters, cozy candles, stews, and the illustrious hot toddy. Being of Scottish and German ancestry, Sarah and I were raised with the utmost respect for this wintertime tradition. Without further ado, here is a recipe from my personal stash. First, heat up the water until it begins to boil. While the water is heating, toss all the ingredients in a mug. Once the water is heated, add to the mug and stir. Enjoy! *In the heat of cold season I sometimes switch 1 shot of whiskey out for 1 shot of apple cider vinegar. Over the past couple months, I’ve been pushing myself to cook more often. After all the less money I spend eating out, the more I have for trips! One of my favorite things to cook is soup. Soup is great because it’s quick, easy, and freezes well. Chicken soup is a staple in my kitchen. I feel it’s the ultimate comfort food and the perfect pick me up on a cold Chicago day. To start, put the Chicken Stock, minced garlic, bay leaf, harissa, lemon juice, and chopped onion in a large pot on your stove and bring to a boil. While you are waiting for the stock to come to a boil chop the carrots, celery, and peel & chop the sweet potato. After your vegetables are chopped, trim any fat off of the chicken breasts. Once the stock has come to a boil, put the trimmed chicken breasts in the stock. Turn off the burner and put the lid on the stock. Set a timer for 10 minutes and after 10 minutes remove the chicken from the stock. Add the carrots, celery, sweet potato, and frozen corn to the stock and turn the burner back on to a medium heat. Stir the soup occasionally. Let the chicken cool for a couple of minutes then cut it into small bite-sized pieces. The chicken will not be fully cooked at this point which is ok. Added the chopped chicken breasts back to the stock. Bring the stock back to a boil. Once the vegetables are cooked (I usually stick a fork in a carrot or sweet potato) turn off the heat and add the pasta or quinoa. Let the soup cool and add salt and pepper to taste. If you are looking to use less salt, add a little more lemon. Lemon brings out the salt flavor. To cut down on cooking time pick up pre-cooked/chopped chicken from a salad bar. Let soup cool completely before freezing.